Earlier this week we took a trip across the border (luckily nobody mentioned the war) to visit the Hans-Peter Porsche Traumwerk. A new toy museum in Bavaria. This was a really well laid out and beautifully curated museum, and as is typical of Porsche no expense was spared. The lighting was a bit too subdued to take proper photographs which was a pity, but you have to also understand that they are also conserving the exhibits. Upstairs was a large collection of tin toys. This description does the displays somewhat of a disservice as the exhibits covered circuses, zoos, ships, a small amount of military, fire engines and of course trains. Lots of them. There was a gallery looking down to the main attraction, a vast train layout. Again this is an understatement. There were wall projections of clouds and a lighting sequence that cycled between day and night. Clouds passed over the mountains and an immersive ambient soundscape. I’m not really a train person, but I wouldn’t mind tapping into that market, so the trains weren’t all that exciting. But the scenery was to die for. Really well done, again it was attention to detail. You would look into the windows of a house and see that it was fully furnished. Well worth a visit, but bring sandwiches as the restaurant was expensive (I’ve never had a meal that has been up to scratch in Germany) and the kids adventure playground was very well designed. So how is the Dragon going I hear you ask. I am going to stick with the colour scheme, but I have been prevaricating. Again. 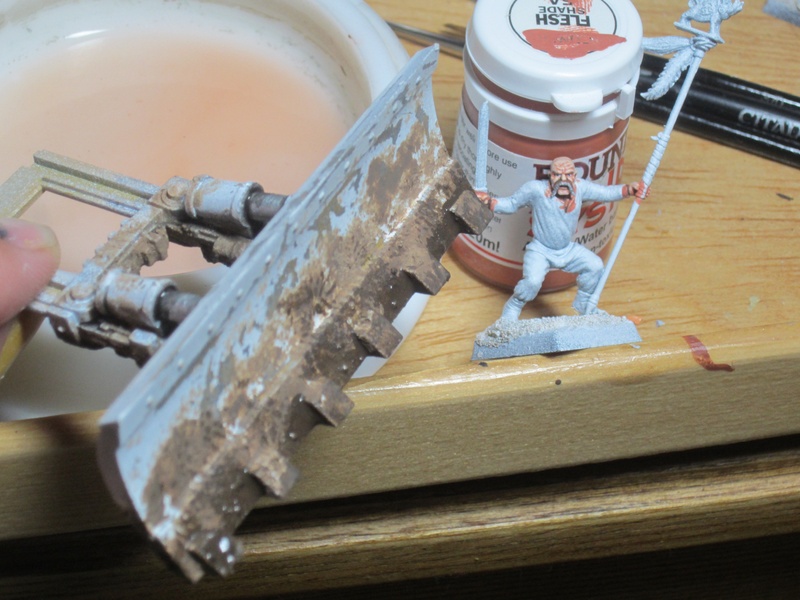 Continuing the Undead theme and the Bob Olley addiction. 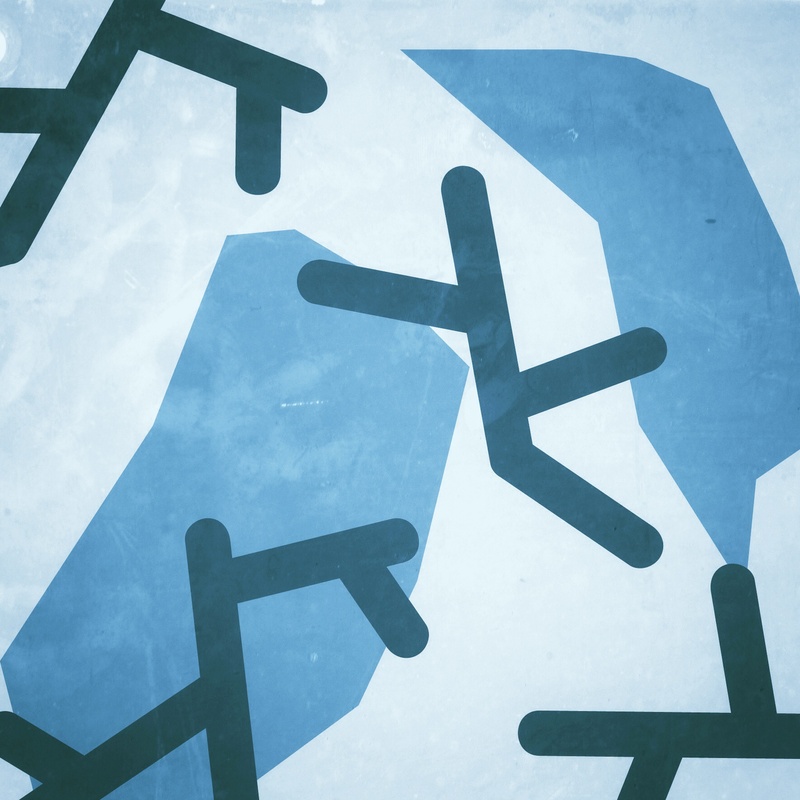 So now I have a command group. And this chap, sculpted by Justin Coutange from the Oldhammer community. This was another entry to the Warhammer Salzburg “Spooky” painting contest. I finished him with a couple of days to spare, but I didn’t get into town to submit him. The figure that I did enter came second, so not too bad. And finally this figure from Grimskull Miniatures. A bit T&A but I thought she would go nicely with my Raging Heroes Not DKK army. So there you have it. Time to tidy the desk and knuckle down with the dragon. 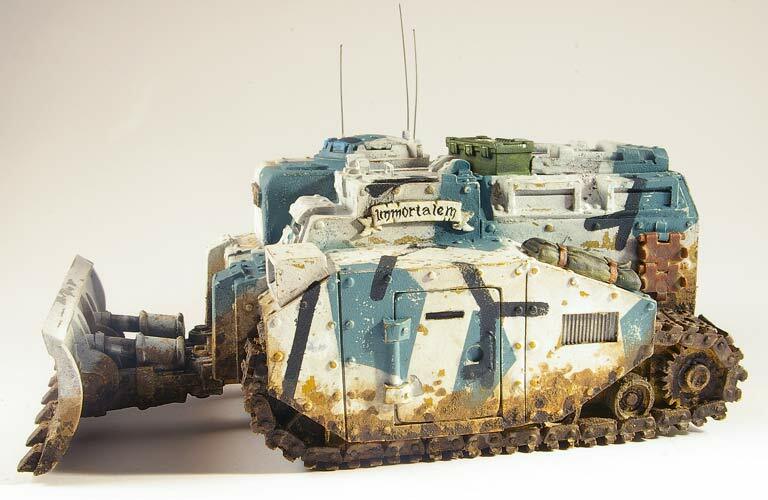 Here are some, ahem, Forgeworld Deathriders which will be serving as Rough Riders in my Imperial Guard army. This is what I have planned for this months workbench. The main job is to finish a unit of Mantic Undead which will be used as Fir Bolg in my Albion Army. 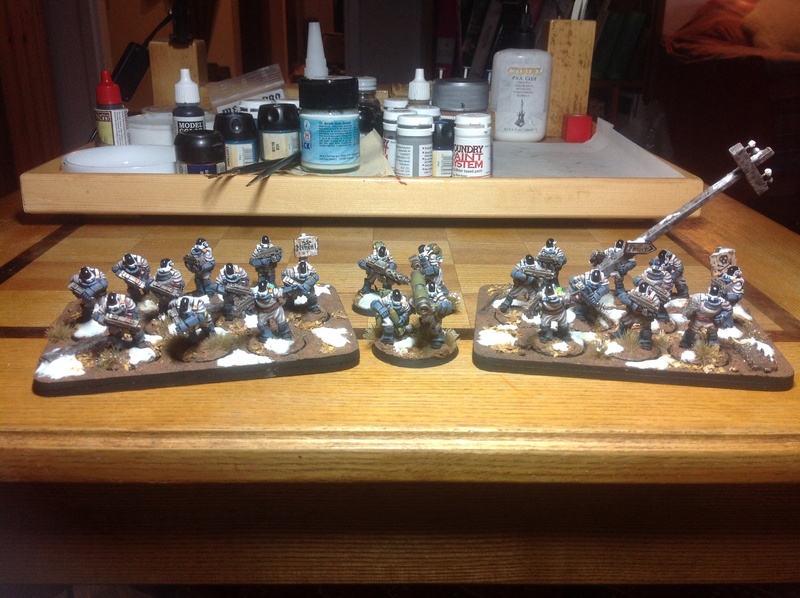 Next up is to finish a unit of Home Guard for my Bolt Action Army. The figures are from Foundry and feature some well known characters. 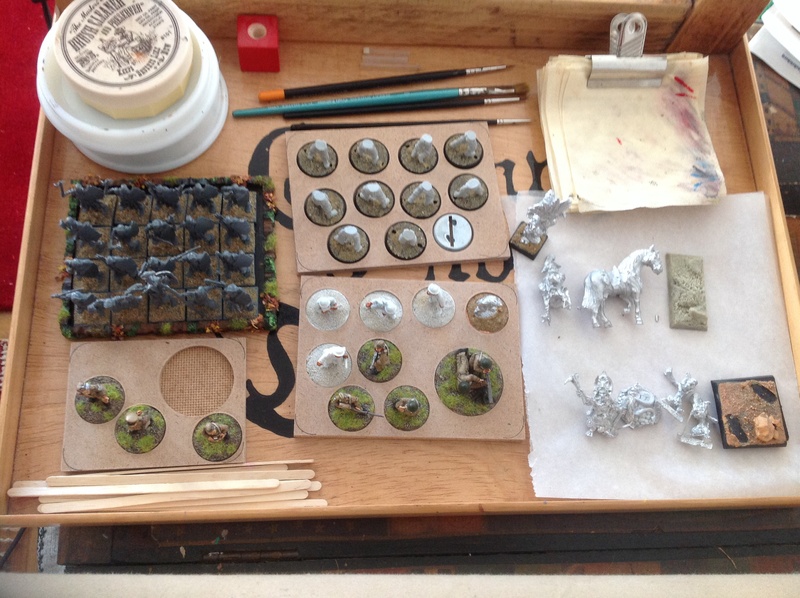 I want to get a Penal Unit, top center, prepped and ready for painting. They are from Victoria Miniatures and they look very very good and I can’t wait to paint them. Maybe in the New Year? 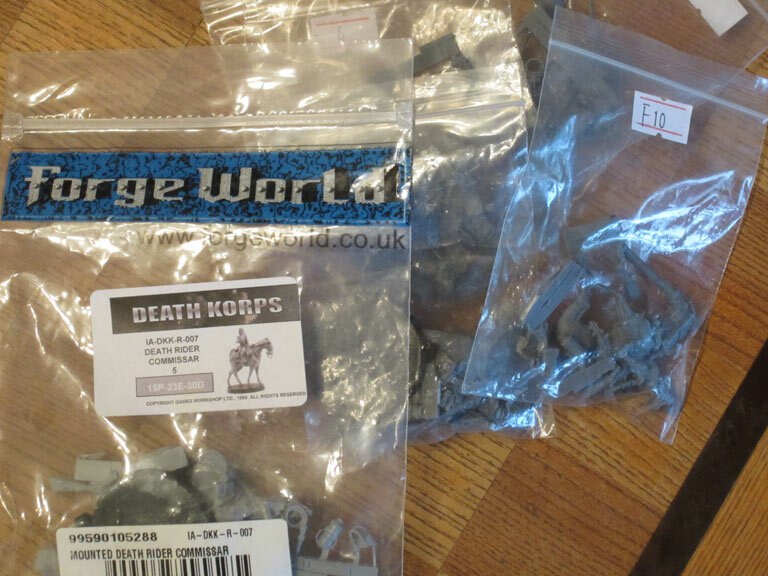 These are destined for my 40K Imperial Guard/Not DKK Army. Finally on the right are some Arcworlde figures, just for fun. 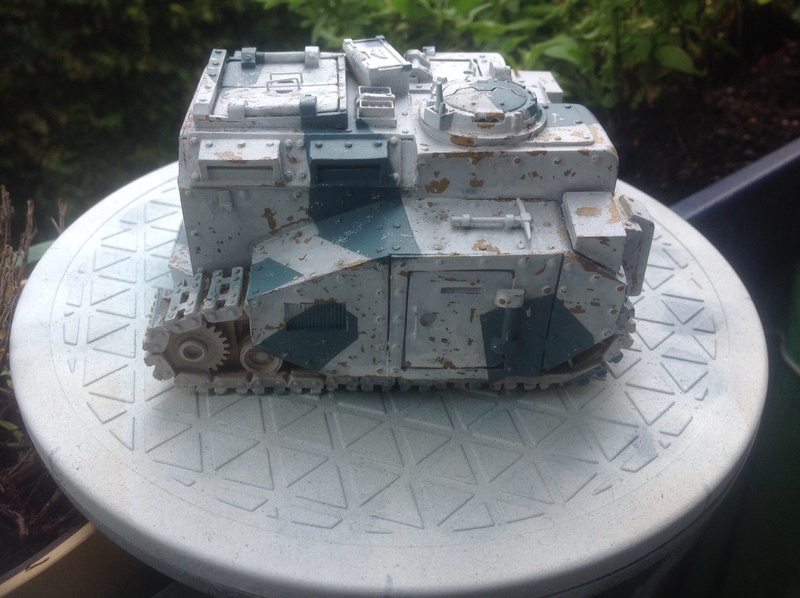 Here are some work in progress shots of my command vehicle used in my Not DKK Army. Vehicle by Ramshackle Games from the recent Kickstarter. 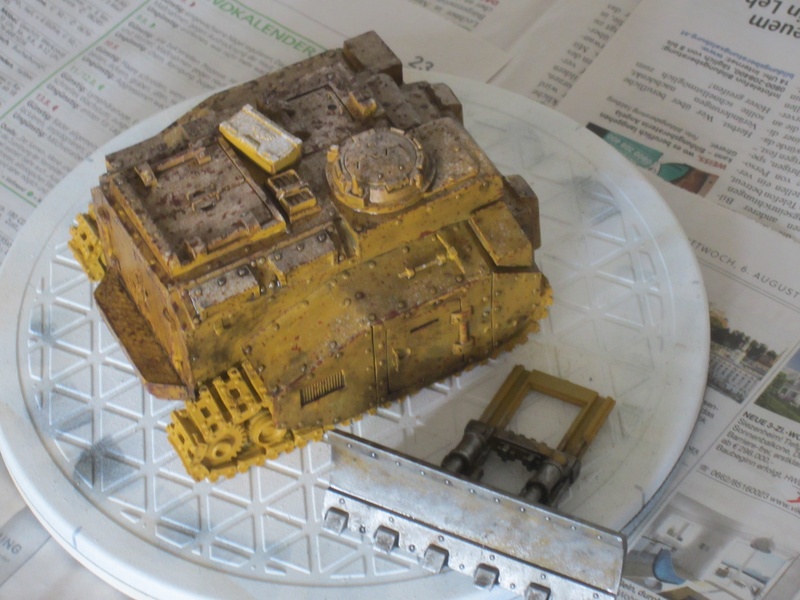 Weathering finished and dozer blade. Rubbing away the white paint. I used the Hairspray Technique for this. 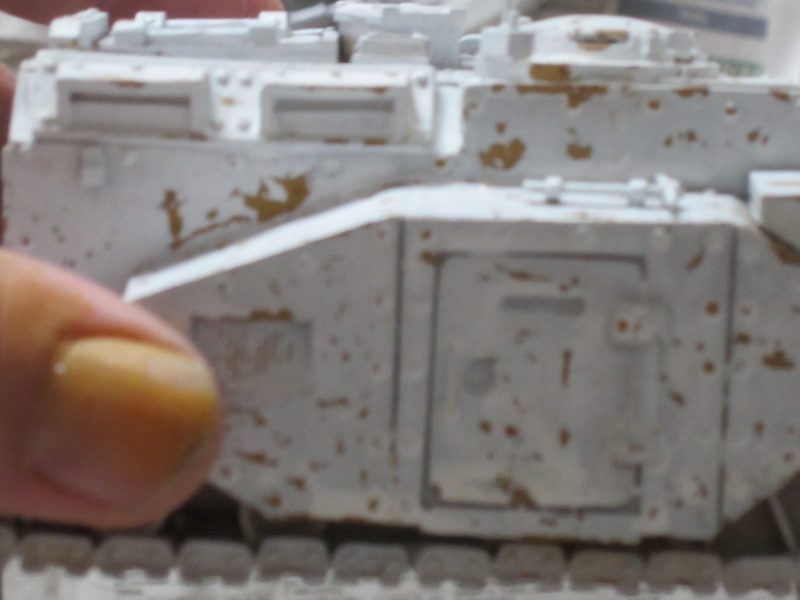 It is a bit disheartening to spend hours painting on weathering for it all to be painted over. 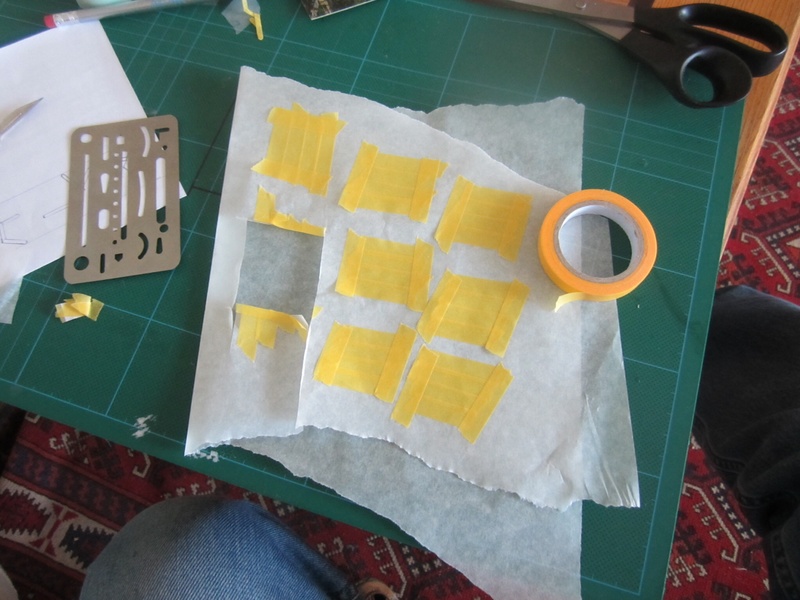 Cutting the masking for the black stripes. 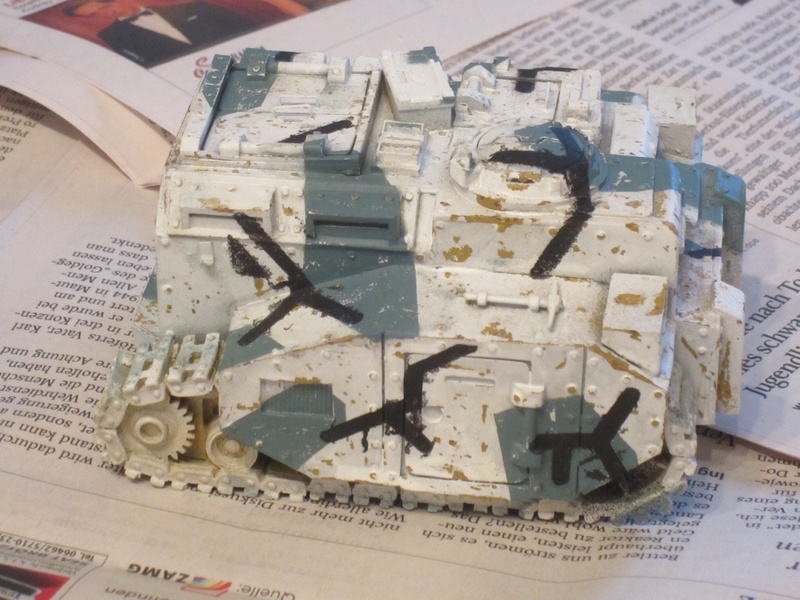 This camouflage scheme was inspired by the film, “Inception”. Black stripes. I wasn’t as successful as I had hoped with the masking and had to do a fair amount of retouching. Start of muddying up the dozer blade. 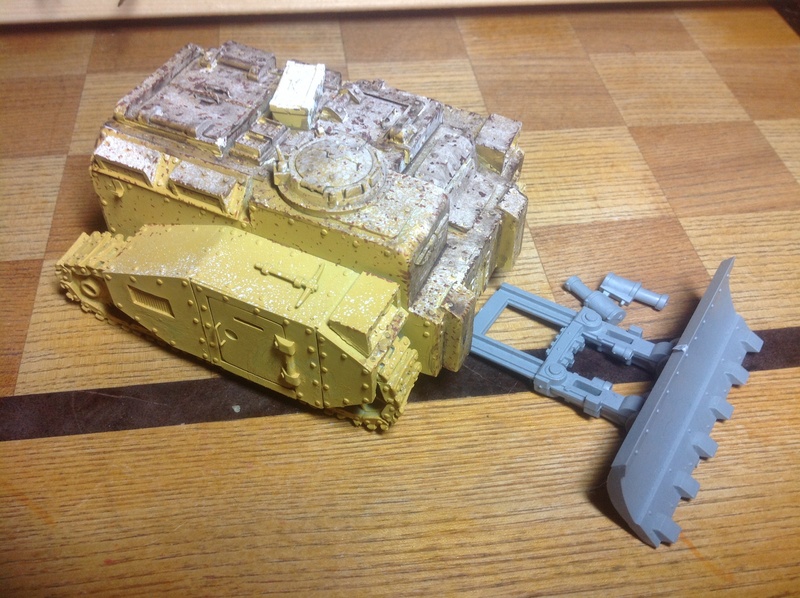 I used weathering products from AK Interactive. 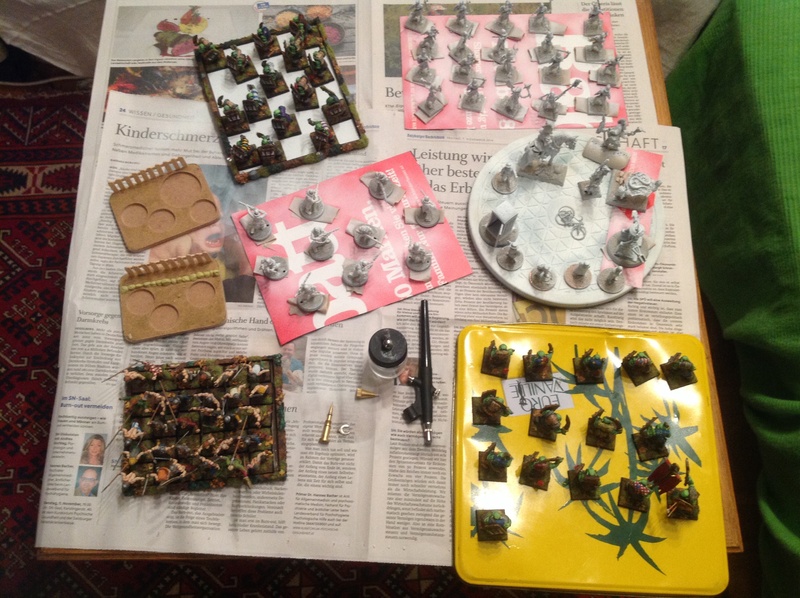 This last month saw me more involved with the Boys so there was less time devoted to painting. 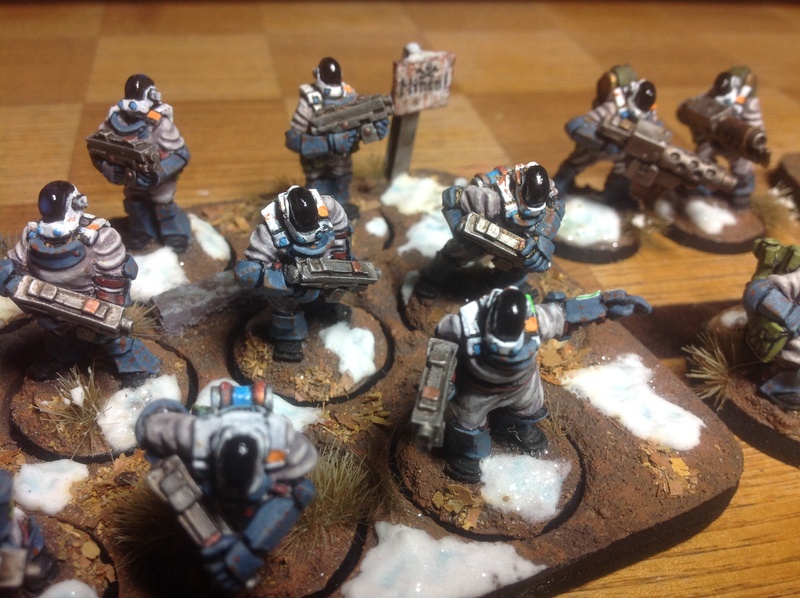 I managed to finish two squads of Ramshackle Games “Iron Brotherhood” troops from the Kickstarter campaign, but I didn’t manage the command vehicle. These will complement my Anvil Industries “Tox Troopers” and the Raging Heroes “Toughest Girls of the Galaxy”, another Kickstarter I backed. 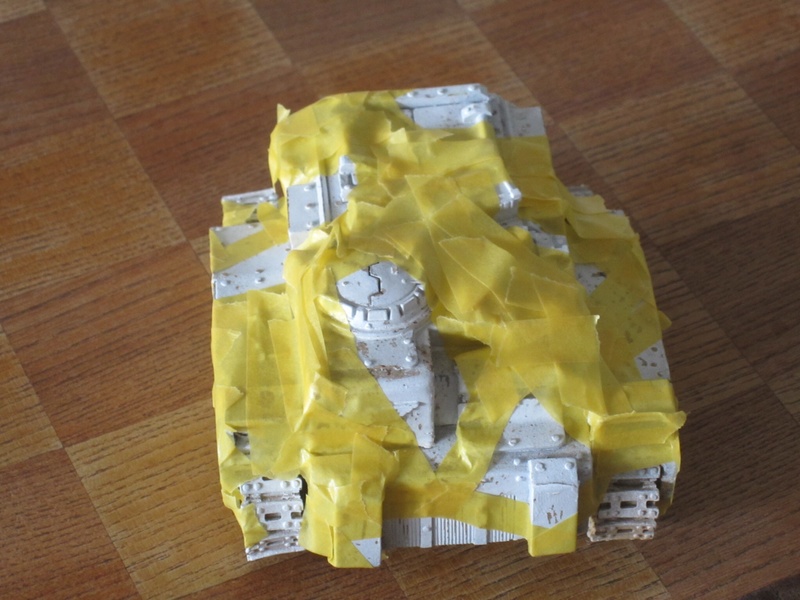 As you can see, a far amount of work to go before I even start on the camoflage. Am I the last person to the party with this resource? I just spent an afternoon reading and adding to my “Library” all the books that I had thought of tracking down on eBay. Warhammer Ancient Battles for forty quid? I don’t think so. Most of these titles I’d only look at once or twice a year so money (I don’t have anyway) saved. A fantasy war gamer grumbles into his beer.